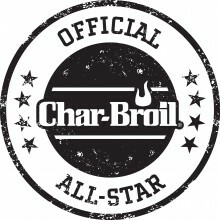 Grilling.com has asked its VIP Bloggers (and I happen to be included as one) to come up with hot dog recipes to celebrate baseball teams and cities. I grew up a fan of the Big Red Machine, and the Reds will always be my team! Findlay Market, the city’s longest open community market, is the heart of the Cincinnati Dog, which is fitting, as it’s also the starting point of the city’s annual parade on the Reds’ opening day. 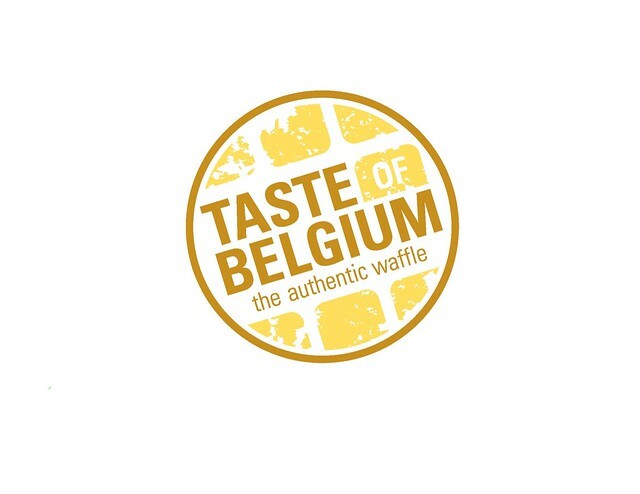 Starting with the ‘bun’, Taste of Belgium makes Liege waffles, the ‘other’, and better, Belgian waffle. These are dense and sweet, and great topped with just about anything. Jean-Francois has opened his bistro in the heart of Cincinnati, only a few blocks from Findlay Market, where he first offered these amazing waffles. To transition from bun to dog, another Findlay Market that sells their products through the farmers market part of the community market is Fabulous Ferments. Jennifer and Jordan have a shared passion for raw, healthy, sustainable and local foods, and they make several styles of fermented veggies. They’re great people, too! In talking with them, I discovered that there’s an Apple Cinnamon Cranberry kraut that sounded perfect for the Cincinnati Dog, so they gladly provided some to add to the effort. The last local ingredient was also from a Findlay Market vendor, Mike’s Meats. They make their own goetta, which is a Cincy area food that even has its own festival. It’s a German concoction of pork sausage and steel-cut oats. For the Cincinnati dog, I used Gliers Goetta Dogs, made in Cincy. The only other addition was to drizzle a bit of maple syrup over the dog, adding a bit of sweetness to bring everything together, from a local farm, Clough Valley. 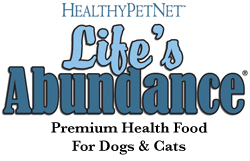 Thanks to Fab Ferments, Mike’s Meats and Taste of Belgium for being a part of the Cincinnati Dog! No Cinncinati chili?! That’s Cinnful! But seriously, nice work Curt. That was too easy, and already done really well by Skyline Chili. This was just a way to bring in some other, smaller food people in the city. All great products and really top people! Now that’s an inspired dog! 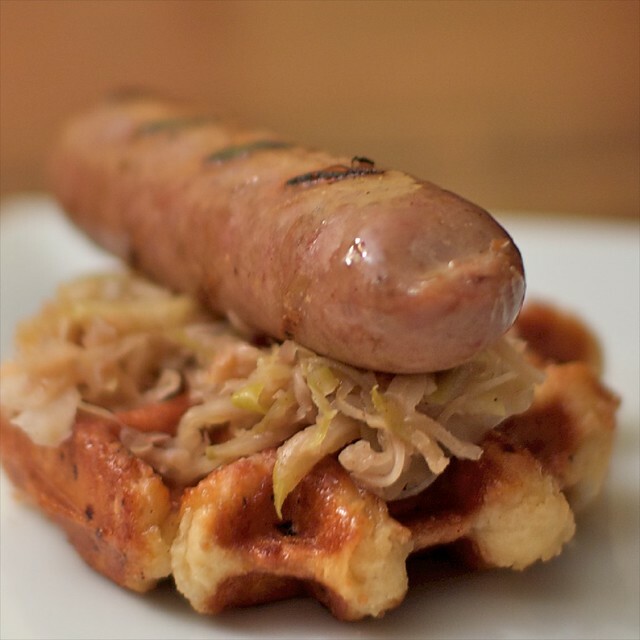 The waffle bun is not only “outside of the box thinking”, you set the box on fire. I have never heard of goetta before, do the oats give it a different texture than regular dogs? The goetta isn’t that different in texture, but lighter in flavor. The sweetness of the syrup with it is actually quite good! I am a new convert to sauerkraut. I just gave Ms. Goofy a waffle maker for Valentines day. Great ingredients and yummy photos. Inspirational. 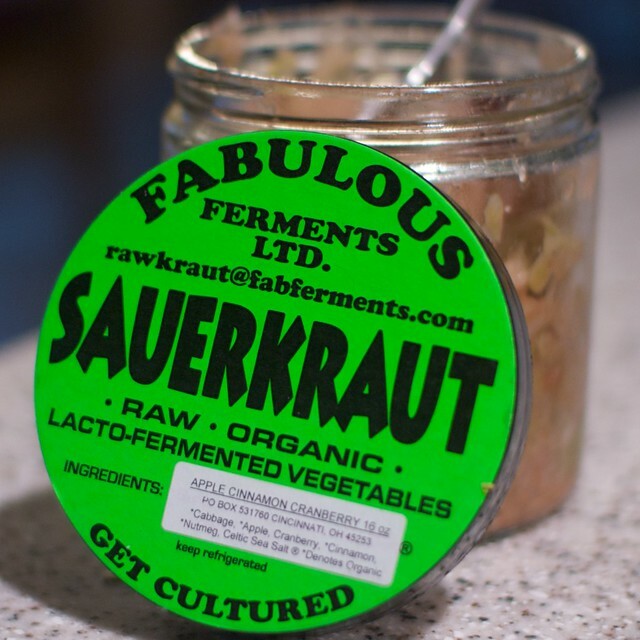 Handmade sauerkraut like Fab Ferments makes is a thing of beauty. Their kimchi is just amazing, too!